Black Lake – Part of the 1000 acre Walter and May Reuther UAW Family Education Center, Black Lake Golf Club is northern Michigan’s latest golf creation. Golf Digest recently awarded BLGC 2nd place for “Best New Upscale Public Facility” in America. This beautiful course is owned and operated by the UAW for UAW members and guests, as well as the public. Dunmaglas Golf Course – Located in Charlevoix, this course offers rolling terrain, mature forests and awe-inspiring views. This is just part of the story at Dunmaglas. 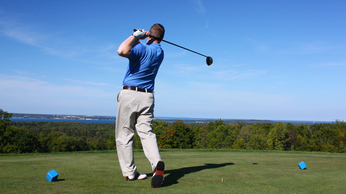 Little Traverse Bay Golf Club – Seated upon one of the highest bluffs in the area, LTB offers magnificent vistas of Lake Michigan, Little Traverse Bay and three other inland lakes. This “hidden gem” is a must see stop during a northern Michigan trip. Four tee selections make Little Traverse Bay Golf Club a favorite for all. Elevated tees and many downhill holes add to a player’s enjoyment and confidence. Belvedere Golf Club – Located in Charlevoix, Belvedere is one of Michigan’s historic golf venues. This classic course was designed by Willie Watson. Check out their website for all of the details. Trout Creek Staff – they were like family! You are welcome to either give us a call at 1-800-748-0245 or visit the Big Fore Website…fill out the quote request form and we will send you a package price.